Luremaking.com stocks the largest selection of musky and pike components in Canada. Lets us help you make the best musky lures and leaders available anywhere. 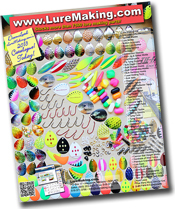 If you are into muskie fishing then you need LureMaking.com's muskie and pike components. Now you too can make the world's best musky lures. For making loops on 0.051" and 0.062" wire shafts. Big Wire Twister -NEW Updated Design! Big Wire Twister Pro -NEW!